We love all things pumpkin this time of year! 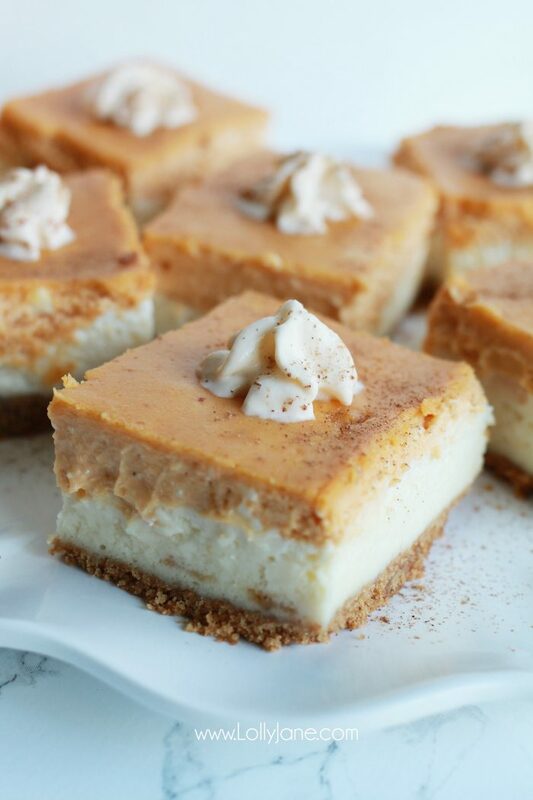 These thick and creamy Pumpkin Cheesecake Bars were a huge winner at our family Sunday dinner so we had to share the recipe here! 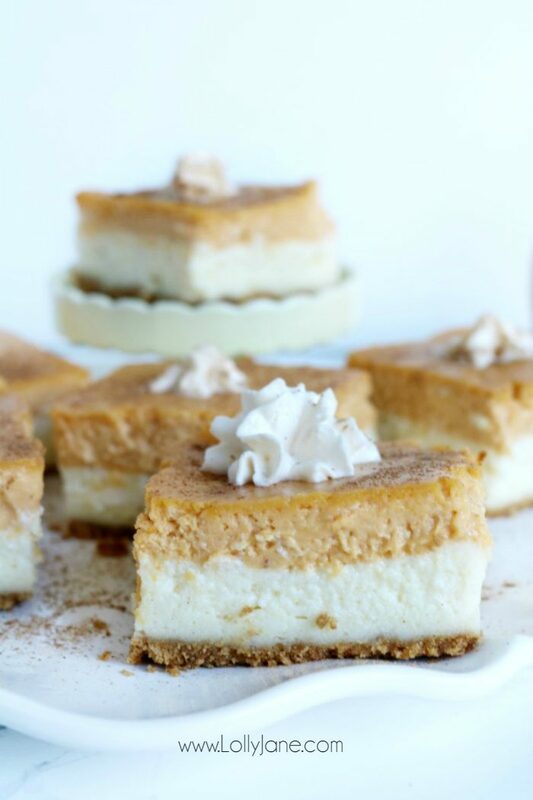 We typically opt for no bake cheesecake like our Pumpkin Cheesecake Ecstacy recipe but this was pretty easy to make so it’s a new addition to our go-to fall dessert recipes! 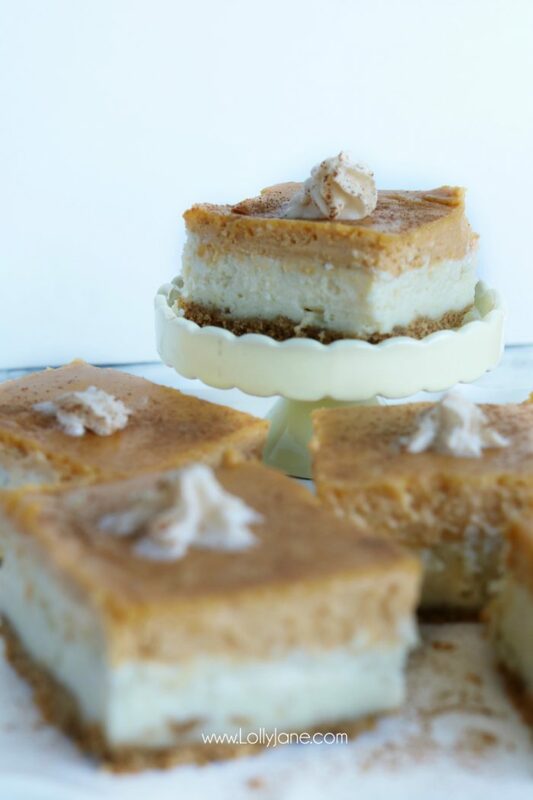 You’ll love the rich cream cheese filling paired with the thick pumpkin spice layer, so good! 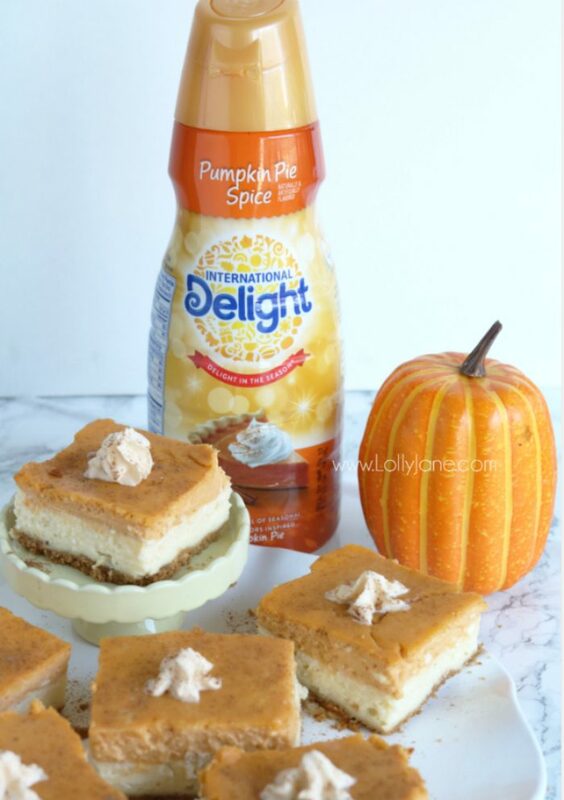 We added even more pumpkin goodness to the filling using International Delight’s season Pumpkin Pie Spice Creamer, holy yum! I’m so excited to add their new creamer to my nightly hot cocoa cup all winter long, mm! 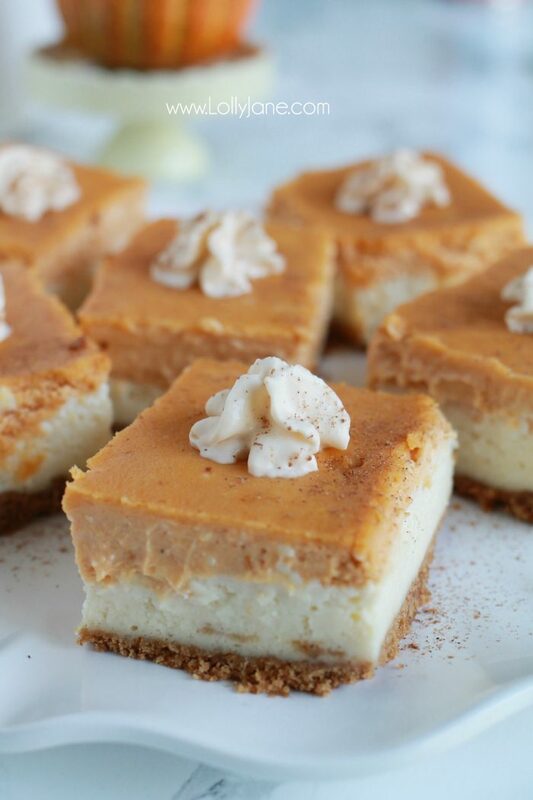 If you regularly stock pumpkin puree and cream cheese like we do, you’ll most likely have everything on hand for this recipe. I did run to the grocery store to grab some graham crackers but had everything else laying around. I was excited to use the rest of my pumpkin puree up since we made these Pumpkin Chocolate Chip Cookies last night and had leftovers. I hate finding open cans in the back of the fridge with wasted contents, don’t you? Let us know if you have any questions about this recipe, we think it’s a keeper! 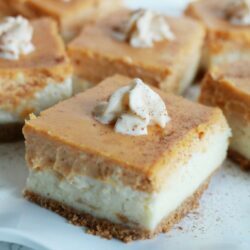 Thick pumpkin cheesecake bars recipe. 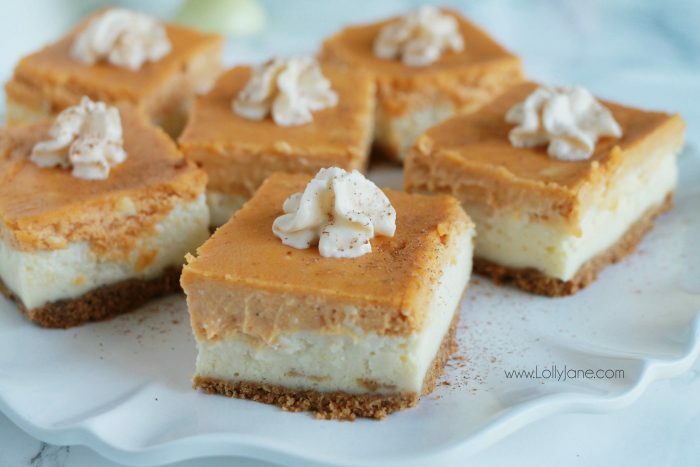 Creamy cheesecake flavor with a hint of pumpkin spice, the perfect combination. Line a 13x9 baking dish with wax paper. In a bowl, combine the graham cracker crumbs with the melted butter. Press crust on the bottom of the dish. Set aside to create the filling. In the mixing bowl of your stand-up mixer , add cream cheese and sugar. Beat on low speed until light and fluffy. Spoon HALF of the mixture over the crust, spread evenly. 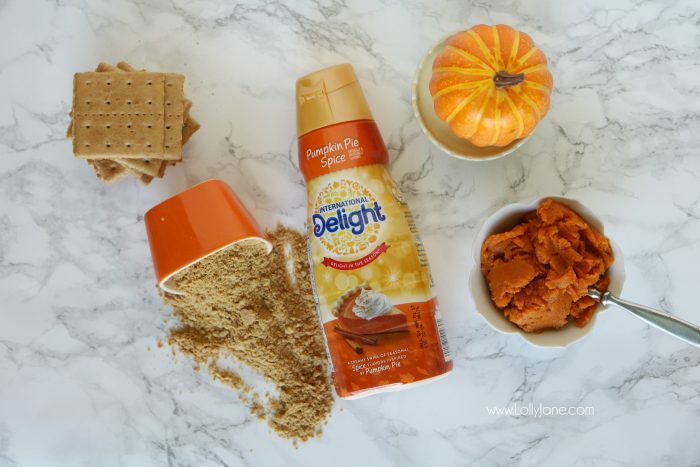 To the remaining mixture, add the pumpkin puree and pumpkin spice creamer. 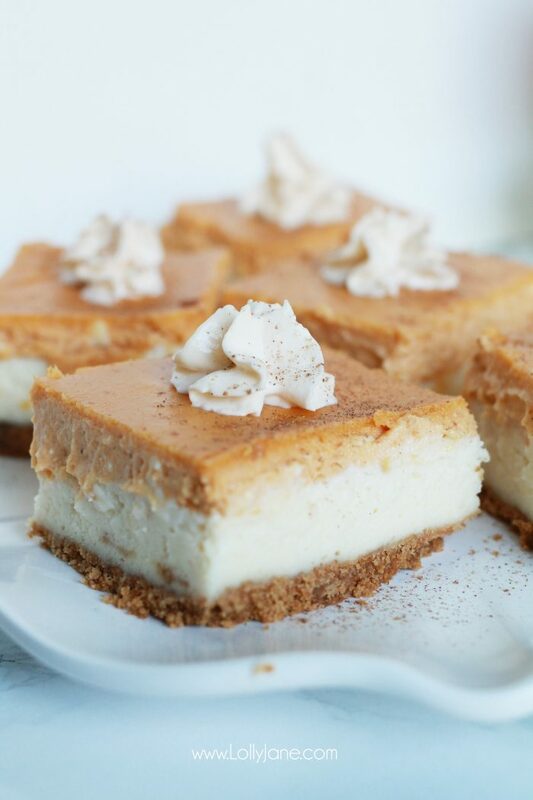 Top each bar with whipped cream, sprinkle with finely chopped pecans or pumpkin pie spice or both! The smell of it baking made us drool!! But do let it cool for 3 hours to firm up, as tempting as it is to dig in! 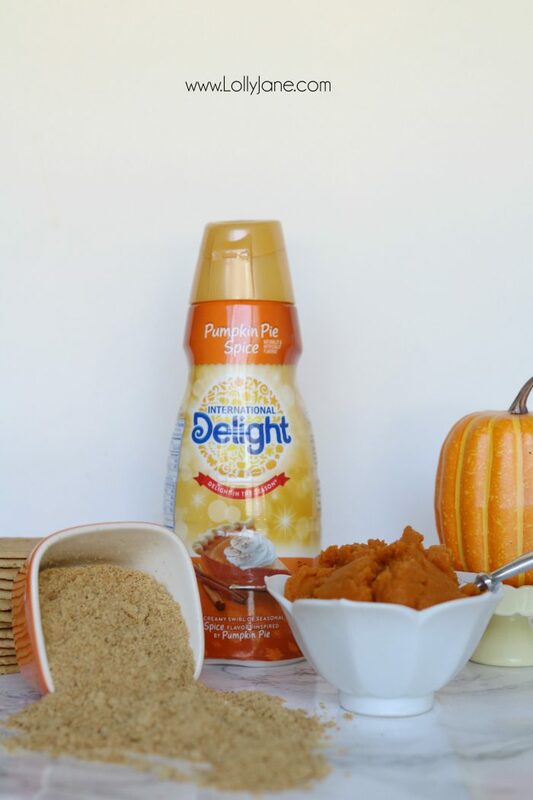 ID Pumpkin Pie Spice Creamer is also available in a sugar free option, check your local stores to see where you can score both yummy flavors!